✓ Temperature knob that you can use to dial into the perfect temperature, whether you are cooking or reheating food. Also has a keep warm function that keeps your food warm even after the cook cycle is finished. 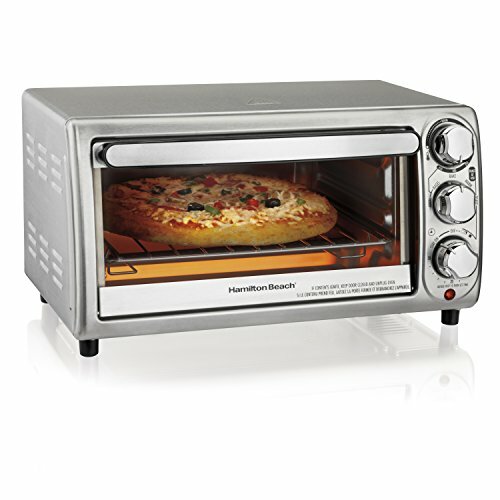 ✓ If you are a pizza fan, this oven is great for personal pizzas. The inner capacity of this oven has enough space in it to fully cook a nine inch pizza. ✘ The knobs may be easy to use, but the timer offers virtually no settings or space on the knob in between lightly toasted bread and really toasted bread. It is almost like you can only select burnt bread or warm bread, and nothing in between. ✘ This toaster doesn’t include any features like an LED screen, or an automatic shutoff feature when you open the oven door. It just gets the job done. For the price and everything that this compact toaster offers, it is really hard to beat. 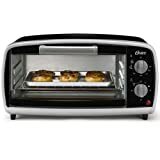 It is one of best toaster oven under $100 in our reviews. For the same price as an average microwave, you can get better tasting food, in faster time. This oven gives you all of the basics when it comes to your cooking, baking and reheating needs. 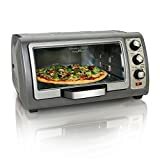 You can use it simply to make toast or toast a bagel, or you can cook an entire personal pizza in it. It is great for reheating leftovers and cooking up frozen foods and appetizers.The three knob dial system gives you all of the options that you need when it comes to choosing the right preset, selecting the right temperature, and cooking time for your food. The keep warm setting is really nice in case you are multitasking while you are using it. The only downsides that we can see with this oven are that it emits a ton of heat, because it is not that well insulated. So make sure that you are careful, especially around the top of the oven, when you are using it and immediately after use. The only other issue is that the toast setting is really all-or-nothing. You can really only select really dark toast or warm bread, and there really isn’t any settings in between. The great thing about toaster ovens is that they are convenient, easy to use, and save so much time. 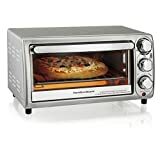 If you are busy at work all day and don’t have the patience to fire up the stove, oven, or grill after a hard day, toaster ovens are a user friendly way to cook food fast. These are great for anyone who doesn’t have the time or patience to cook, but wants that home-cooked taste in a matter of minutes. We really appreciate that this oven offers three different setting knobs for total customization while you are cooking or heating food. With the ability to choose specifically what you are cooking or baking, the temperature, and the time that you want to cook it for, there leaves little left to be desired. This oven may seem small, but it can actually hold quite a bit of food. 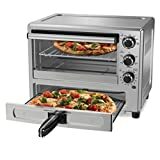 The fact that you can cook a nine inch pizza in this oven is really impressive, and is great for making sure that you get a full meal every time that you use it. This oven is perfect for people with an appetite who don’t have the time to use the oven and stove. The five different preset options are a really nice touch too. Other ovens in this price range may just include a knob for time and another knob for temperature. It is really nice that this oven has a third knob for selecting broil, bagel, warm, or toast. If you like bagels, you will like what this toaster oven can do. Its bagel function toasts the cut side and warms the round side. This oven is great for anyone who wants to make food quickly, but still wants to have that home-cooked meal feel to it. If you are single and don’t have the time or patience to cook food after a long day or just for breakfast in the morning, this would be great for you. We wouldn’t recommend this oven to anyone who is serious cook or is exploring their culinary passion. It would also be difficult to recommend this oven for anyone who is lacking in counter space. 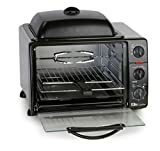 If you are looking for a oven with more functions, you can check out our toaster oven reviews or convection oven reviews.